What a great Market last weekend! It was hot, and a little bit crazy, but the mood was good and the food was plentiful. There will be more heat and sun this weekend, so prepare yourselves. The summer produce is moving right along despite the rain - when it alternates with sun and heat, it'll grow like gangbusters. Our problem last year was that it just rained and never really warmed up - not so much this year. The jewels of the season will be with us soon - sweet corn, tomatoes, and peaches. Setting them off will be be the green things - beans, cucumbers, zucchini, etc. O, 'tis glorious! Some housekeeping - in the interest of getting you shoppers more involved with the vendors that supply you with... everything, I've added some links to the sidebar and will add more as I get them. Please check out these folks' sites, especially if you've never visited them at the Market. You might find some new favorites. I also recommend searching for your favorite vendors on Facebook, if you hang out on Facebook. Maybe at some point i'll create a separate list for Facebook links. 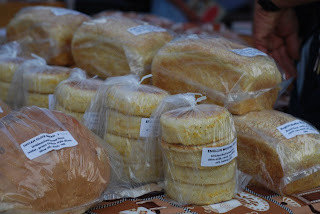 I heard, recently, that I don't write about the baked goods scene at the Market nearly enough. Ack! I certainly didn't mean to leave anyone out. The baked goods, after the farm-grown produce, are a major attractor at the Market, probably because a) these are food items you can eat right away - no washing needed and b) in many cases, you can't get these TOTAL TREATS anywhere else. The Market works with Amish bakers, gluten-free bakers, bakers with croissants, bakers with English muffins, bakers with cinnamon rolls as big as your head, bakers with baguettes and boules... you get the idea. Do yourself a favor this weekend and grab something carby at the Market! Here's this week's Market Menu. Sorry about the squinting. The Market Menu video is taking a break this week. Hopefully we'll be back in business next week. Things are shaping up nicely for the Market this weekend - while there's a chance of rain, the chances are MUCH higher that it'll be hot and sunny, just like last weekend. I tend to look at the weather forecast and not get too bothered by any mention of rain these days. A little rain never hurt anyone, you know what I mean? So, produce. Things are happening with produce thanks to the heat and the rain - Market vendors are offering summer stuff now, like zucchini, cucumbers, raspberries and cherries, blueberries, salad greens (though the lettuces and spinach dislike the heat, so these foods might be limited), peas, peaches and apricots, currants, green beans, green onions, etc. There may be a tomato or two, but expect more next week if the heat keeps up. Yum! Just a reminder, too, that the Market has several meat producers offering up the very best in farm-raised meats of all kinds. Please check out these vendors and, if you're curious about how the animals are raised - ask them about it! Growers love to talk about their farms. Same goes for eggs and cheese and honey - talk to your producer about how they steward their beasts. It's fascinating stuff and helps eaters see why Eating Here is so important. Need I mention all the wonderful baked goods and prepared foods? Shop all five rows for all kinds of food, y'all. It's everywhere in the Market. Come for the food, stay for the art - the Market's many local artisans will have something for the dad in your life. And the kids! bring the kids! This weekend's we're offering up the second Sprouts at the Market event for the season. This event is about defining all those words we hear at the Market and when people talk about food - local, organic, seasonal. What do these words mean? How can kids Eat Here? More importantly, what is there to eat? The event starts at 9 and runs to 11 AM. Kids can start at any Sprouts table within the Market - there are five in all, including the tent at the NW entrance to the Market - and kids who finish the activity will get a Certificate of Participation, which they can use for a 15% discount at Art Mart Toys until 2 PM Saturday. Awesome! Here's a partial list of participating growers: Tomahnous Farm, Moore Family Farm, Tiny Greens, Omega Farm, Blue Moon Farm, Prairie Fruits Farm... many thanks to all the growers who have supported the programming over the last few seasons! OK, this week has ALSO gone by incredibly quickly! I'll have to be quick. A little bird from deep southern IL told me that Mileur Orchard will be at the Market this weekend with a very limited supply of early peaches and apricots. There may be other stone fruits sneaking into the Market from other vendors, too - who knows? Just get there early. Another little bird told me that there will be lots of snap peas and broccoli - maybe look at Kleiss Produce and Blue Moon Farm. There are still going to be strawberries in Row 1 and Row 4. Greenhouse produce is abounding - zucchini, cucumbers, maybe even some tomatoes to go with the hydroponic tomatoes the folks at Three-D have been bringing for weeks now. And, of course, the usual array of farm-raised products (eggs, cheese, meats), baked and prepared foods, and handmade art/craft items will be in full effect. 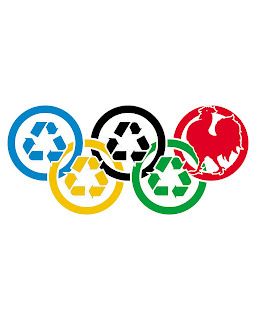 This weekend we'll also be hosting the first-ever RECYCLIMPICS! The Market has partnered with U-Cycle, the City of Urbana's recycling program, to create an event that has fun activities for kids that get them moving and also teach them about recycling. Look for the event on Walnut Street, which is the barricaded area just to the west of the Market site. Eat Here will also have a tent just next to the Market tent. Look for some photos of farms that supply the food sold at the Market, and pick up some information about why including the Market as one of your weekly grocery stops is tasty, fun, and a huge boost to the local economy. Look for our swanky new banners at the east and southern entrances to the Lincoln Square parking lot, too! That should do it for now - remember, the City's new webpage for the Market is here - I hope to be adding much more to it in the coming days. Meaning... it's Thursday and my to-do list for this weekend's Market is as long as my arm. It's been a short week for me anyway, so I'm going to post the Market Menu clip and probably be done with the blog for this week. Sorry about that! Oh - a couple things, though. One: Last weekend's attendance unofficially broke an unofficial record - we had the highest number of attendees ever this early in the season. I have to think the fabulous weather for growing food and the ensuing bounty is a major reason for this. Thanks, farmers, and thanks, Mother Nature. Two: Urbana's Public Arts Coordinator Anna Hochhalter tells me about 250 people participated in last weekend's Art at the Market event - thanks so much for participating at these events while you're at the Market - it definitely adds to the fun, friendly, and SOCIAL vibe that is crucial to any event's success.